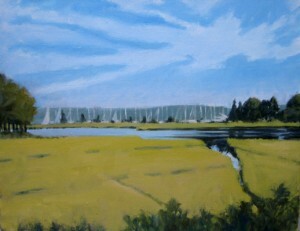 I am a landscape painter who lives and works on the Eastern end of Long Island. My paintings begin with small, plein aire oil studies; larger paintings are completed in my studio. The observation of nature in different seasons and ever-changing light and weather conditions is infinitely interesting to me. The variety of visual opportunity in the outdoors is far more amazing than anything I could ever invent or imagine. In the footsteps of 17th century Dutch landscape, I am particularly affected by the East Ends’ big skies above agricultural plains or far-reaching wetlands. More recently, I have begun painting mountains and deserts in the West and Northwest. Although my work might be called painterly realism, my primary concerns are formal visual ideas as opposed to literal representation. I choose to paint the large gestures of a landscape, not the fine detail. Light, color, and abstract composition are my primary focus.